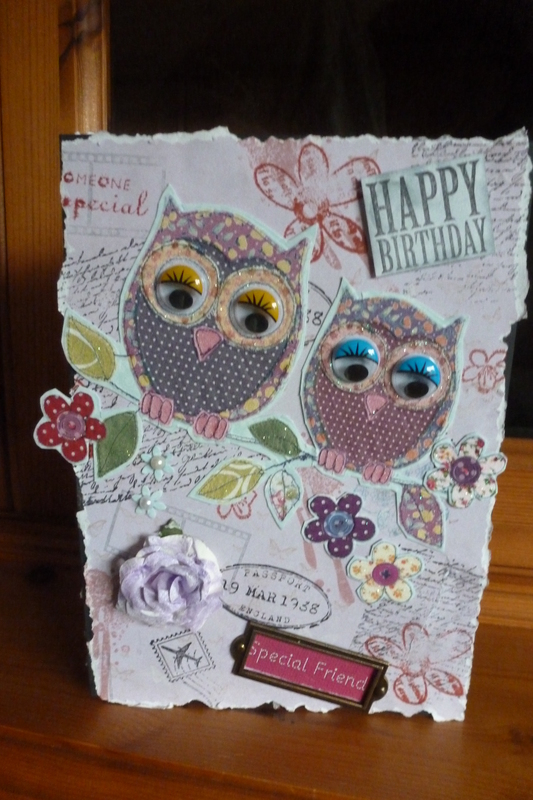 I was inspired by a card that Becky James of docrafts made, using this style, so this is my version! I decided to use all nature themes as I love nature! I hope you like it! I made a double thickness frame for the front, added tissue paper to the one in the foreground and inked it, and added a inner layer to the second frame before I stuck it onto the back of the top frame, if you can make out what I mean! 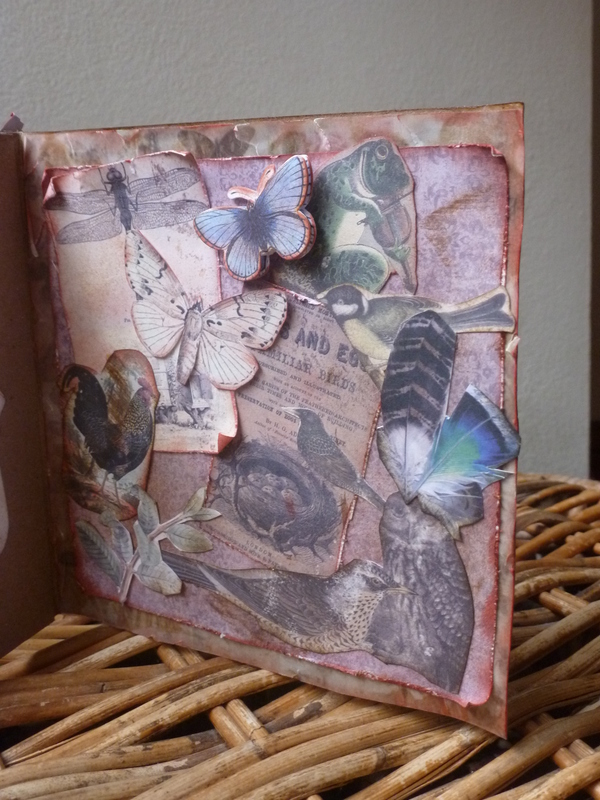 I used vellum for the back of the inside, followed by my nature collage. The only space for the message is on the back! Whoops! There is always something you think of aftewards! 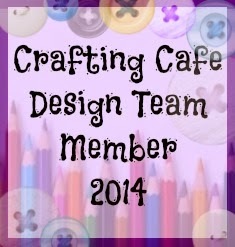 Hi I made this with the free download papers issues to all docrafts Creativity Club members. I do enjoy ripping and curling paper so this is just what I did! 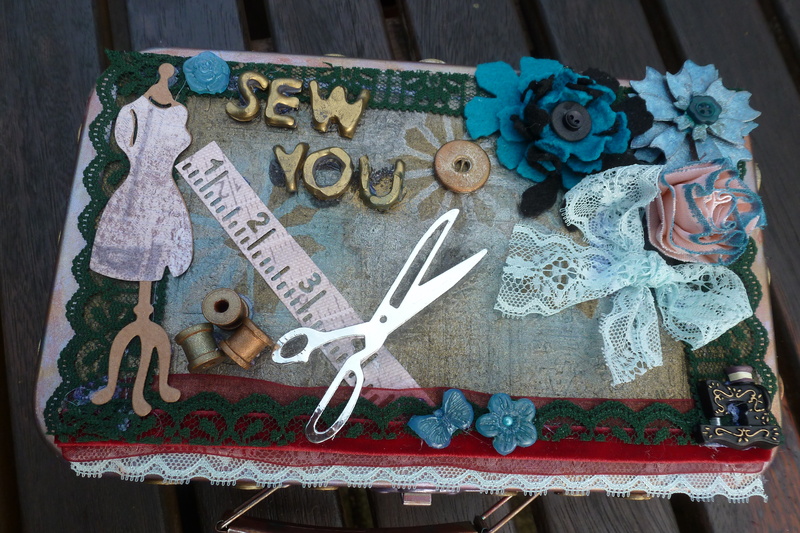 Here is a tin box that I altered to make a sewing box for my sisters birthday. 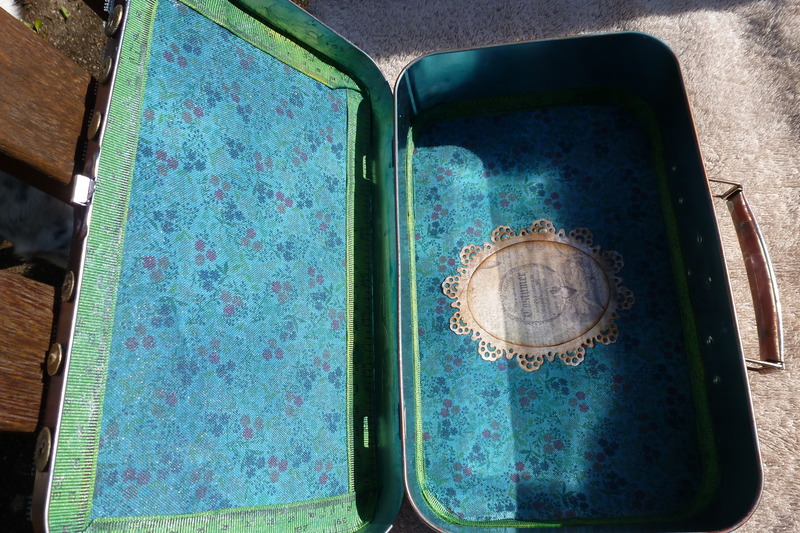 First I rubbed Treasure Gold onto the tin box all over, and let this ‘cure’ overnight. 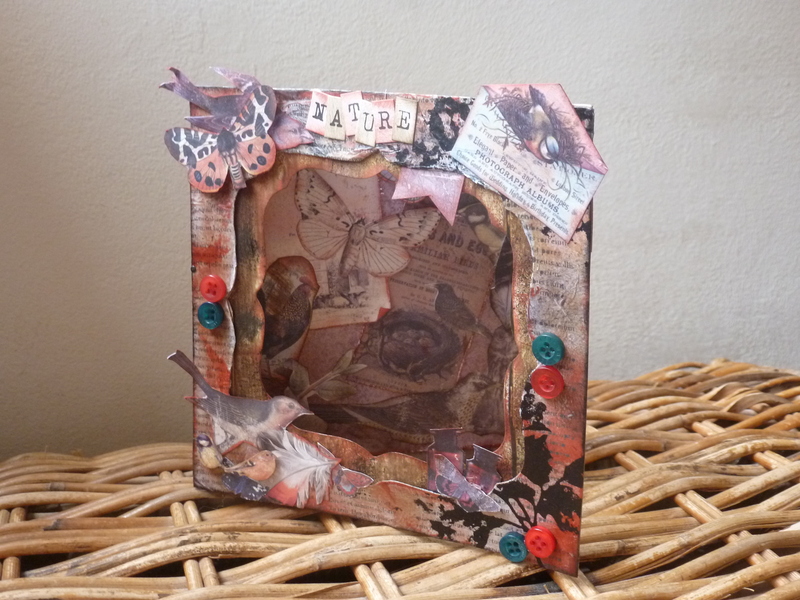 Then I cut a piece of Tim Holtz Grunge Paper to fit the top of the lid, and embossed it with several different dies. I coloured this also with Treasure Gold to age it. 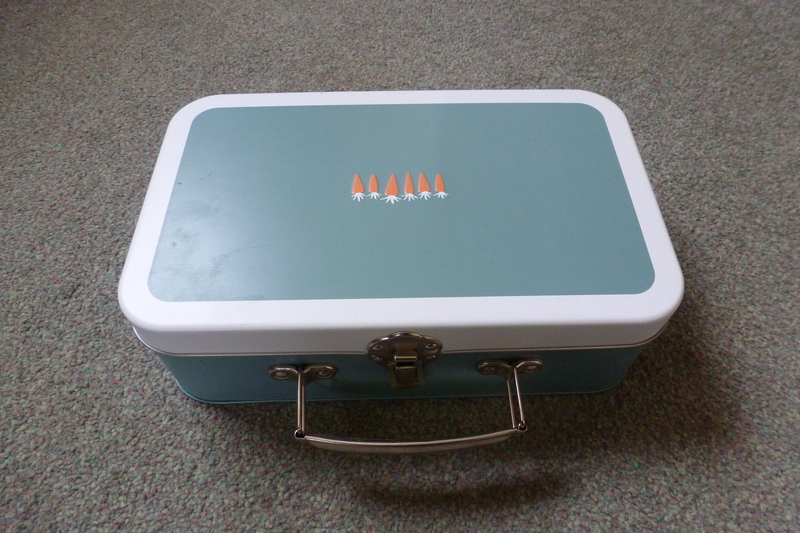 Then I started to decorate the top of the box by sticking things to my grunge paper. 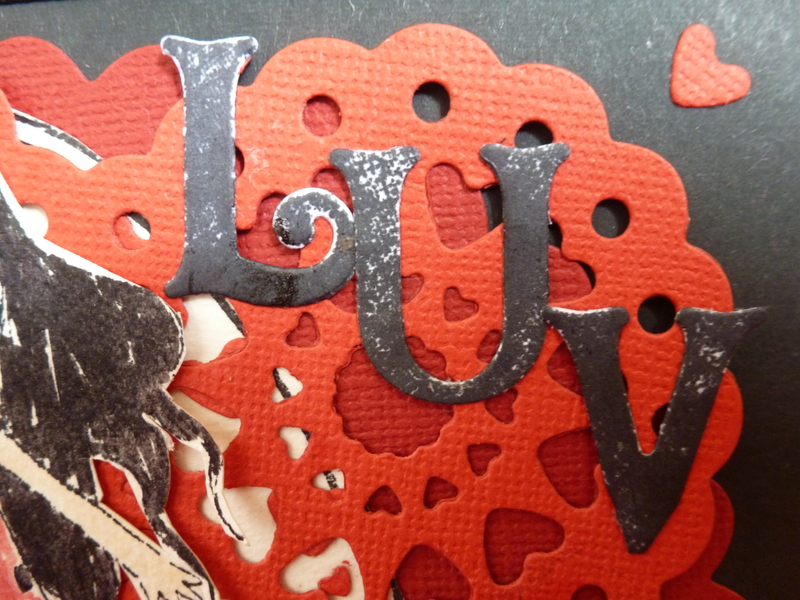 I stuck lace and ribbon around the edges of the grunge paper. 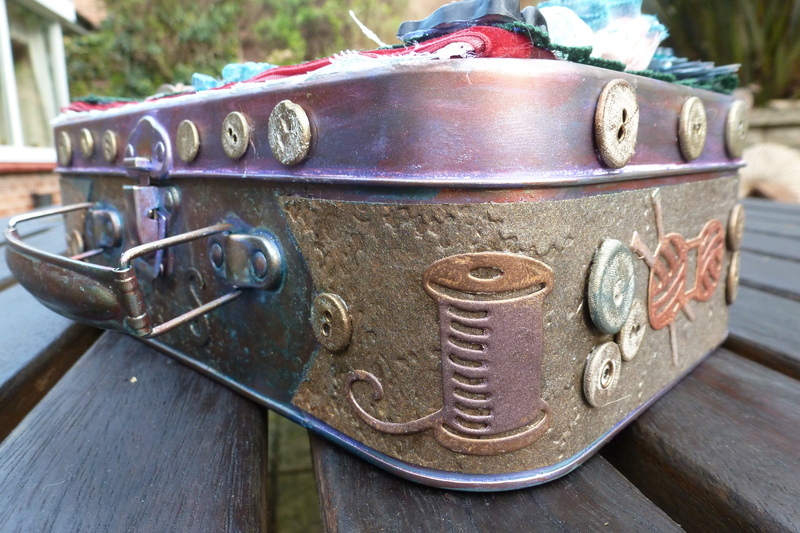 I cut out some XCut Haberdashery dies, and coloured in some Bare Basics cotton reels in Treasure Gold. I used my trusty glue gun and some silicone molds to make flowers and letters. 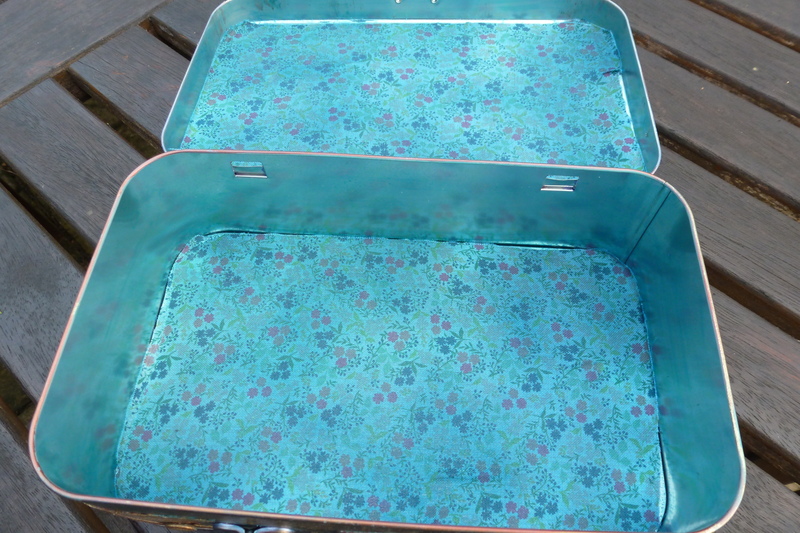 I used Artiste Spray Ink on the flower mold shapes (leave to dry thoroughly) TIP: when using the glue gun, make sure you lift any excess bits that are trailing or sticking out from underneath once glued, whilst the glue is still soft, otherwise it looks awful! Had some trouble with this! I then made a rolled up flower from some Bare Basics peach frill, and dipped into spray ink on edges for effect. I tied and stuck down a lace bow. For the felt flowers, I die cut the felt flowers, then used my heat gun on them to harden and curl the felt a bit, before sticking them together with hot glue. 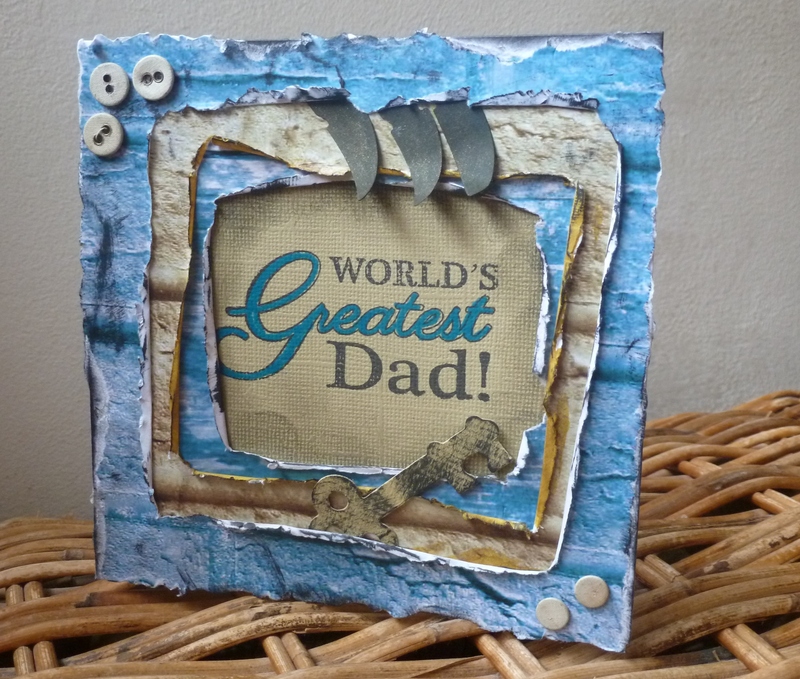 To make the strip around the sides, I embossed my Kraft-Tex paper and coloured with Treasure Golds, then stuck it with a heavy duty glue around the sides. I cut a ‘V’ into the ends to fit around and up to the carrying handle of the box. 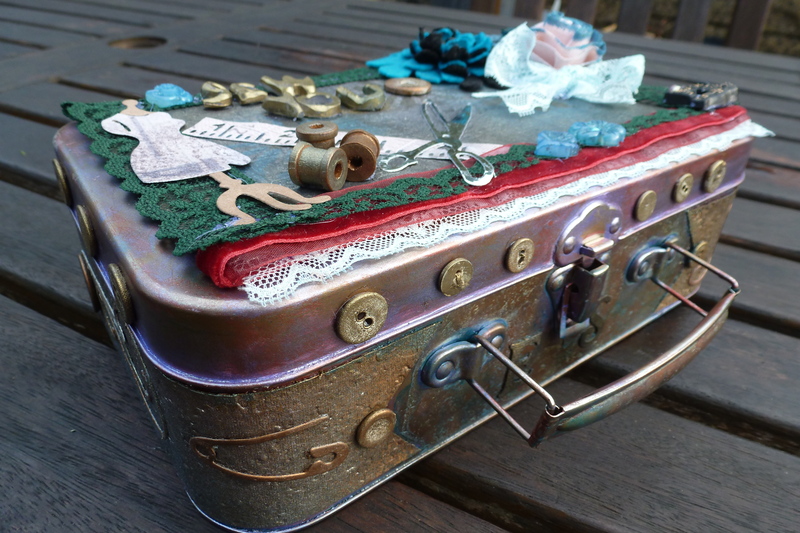 I then used my Haberdashy Dies again to make embellishments; coloured these with Treasure Gold and stuck them on with the same heavy duty glue. (I used E6000 that I bought in the USA). 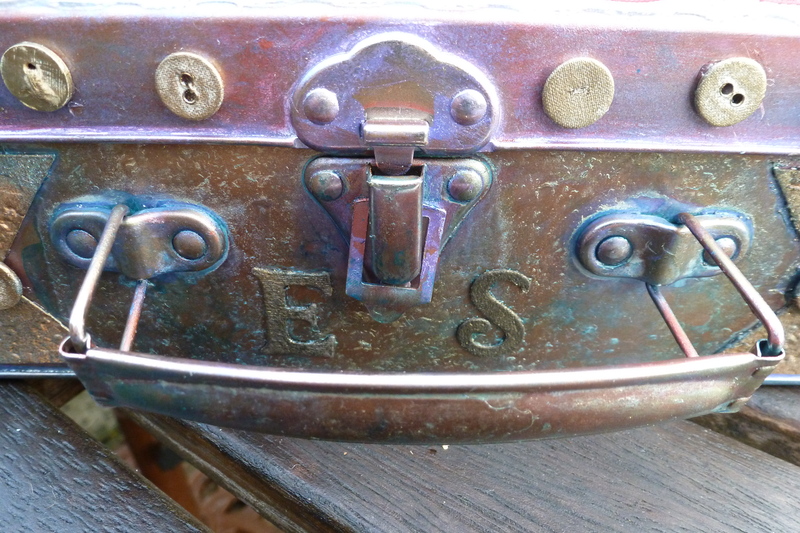 I placed my sisters initials at the front either side of the handle hinges as shown. 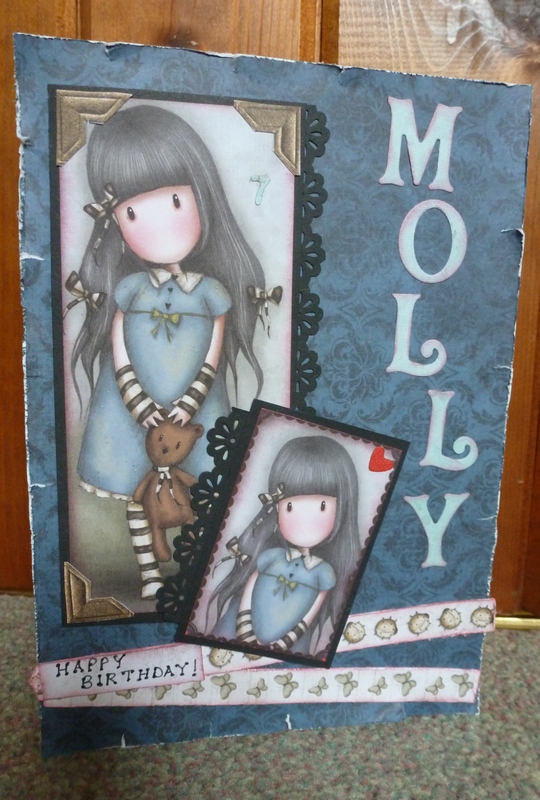 The letters were die cut with XCut ‘Alice’ alphabet dies. Spray the fabric and the tape before inserting into box. 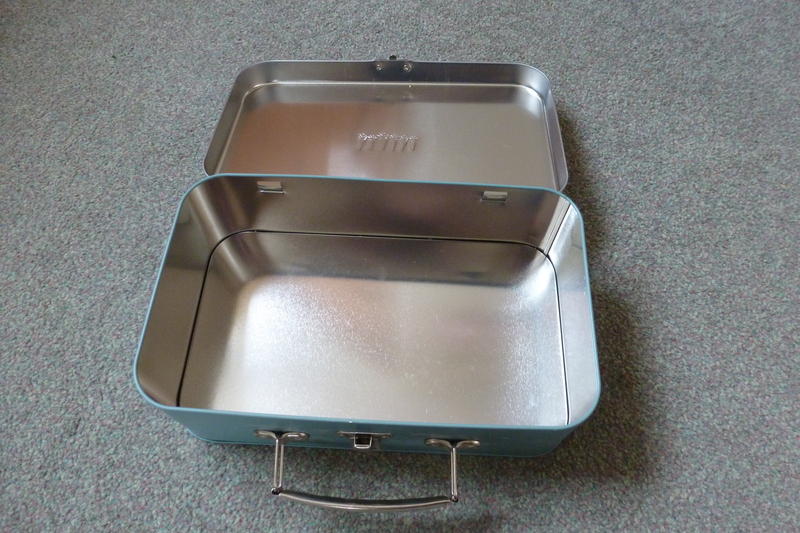 Again, the tape was a bit tricky to fit inside the lid, as you have to make sure the box can still close! I then die cut oval for the bottom of the tin from the Madame Payraud papers by Papermania with the word ‘Costumer’ in the centre of the oval! 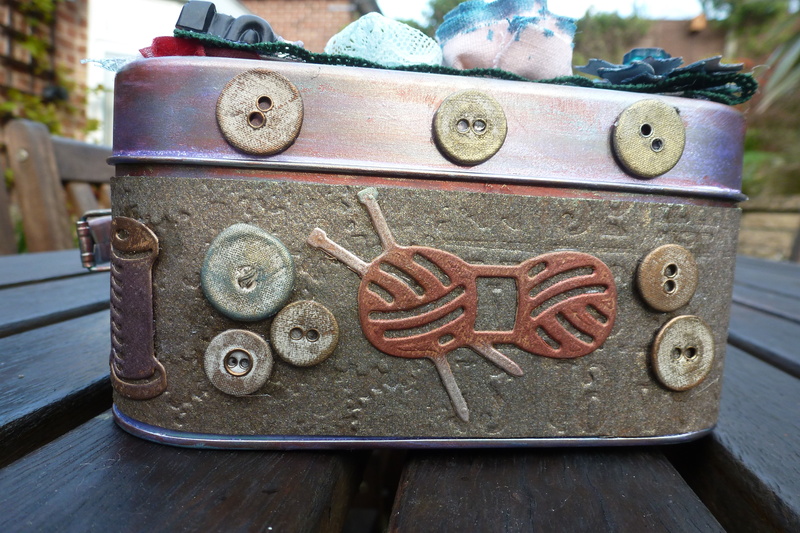 For the last detail, I used Treasure Gold on some linen buttons I picked up at a car boot and placed these around the rim of the lid and onto the sides. I hope you enjoyed this tutorial and are inspired to try something yourselves! If you do, please send me photos or a comment with your blog link so that I can come see your work! Thank you! 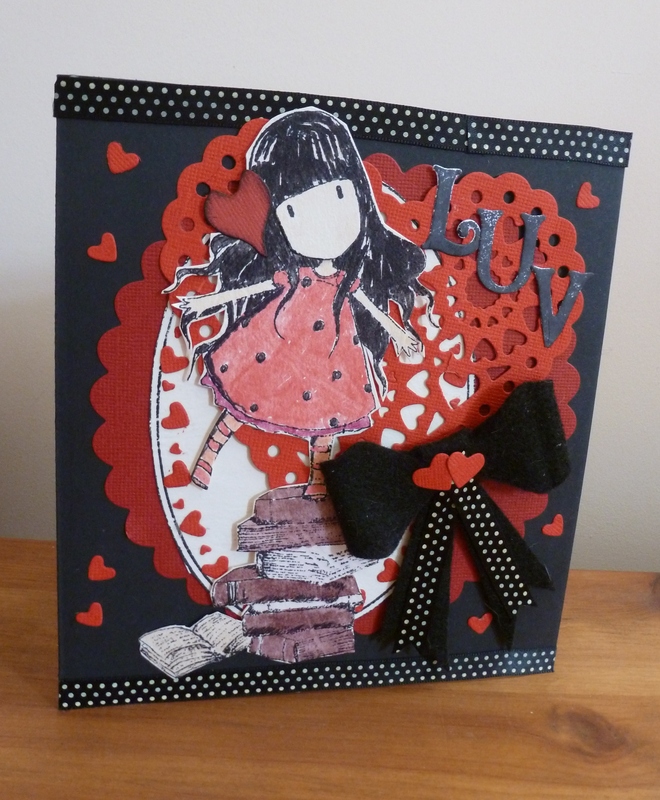 Here is another card made from the Bellisima range. 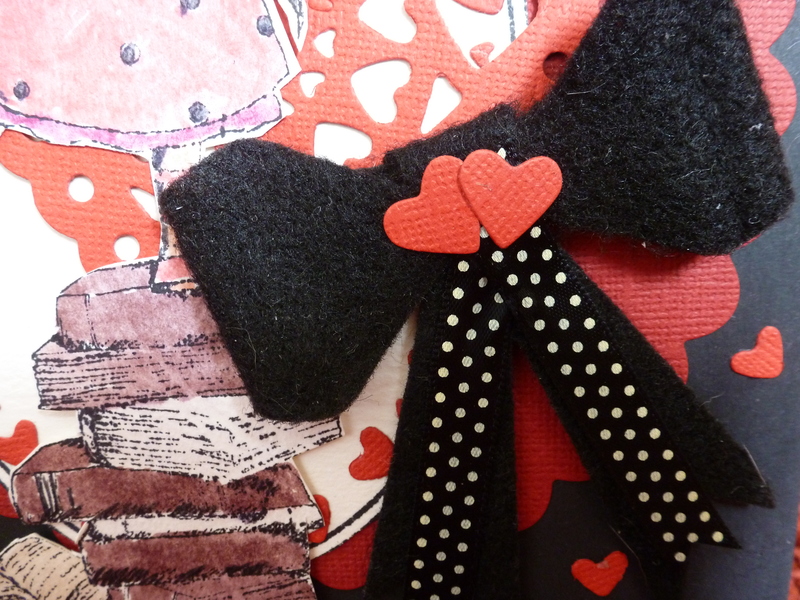 I made the bow on the bottom from some Papermania frill and a Pin Wheel decoration. Hello! 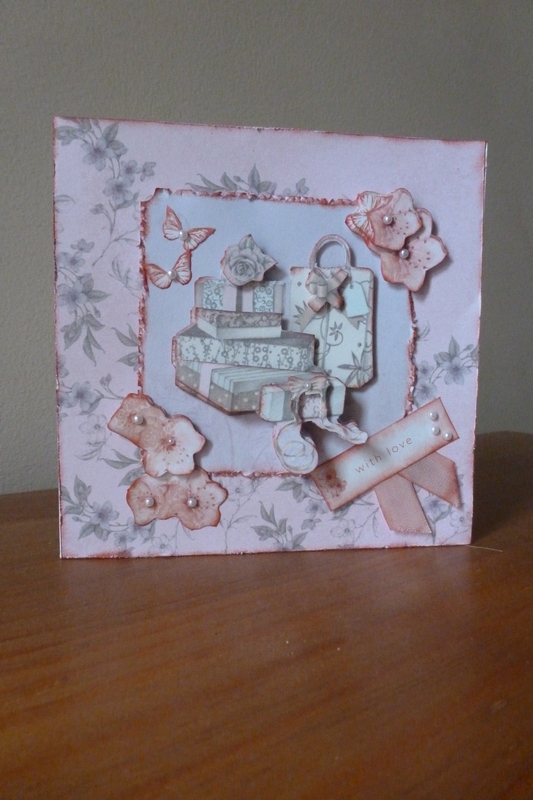 This is a card I made from the Bellisima Range from Papermania, its very girly and I hope you like it! 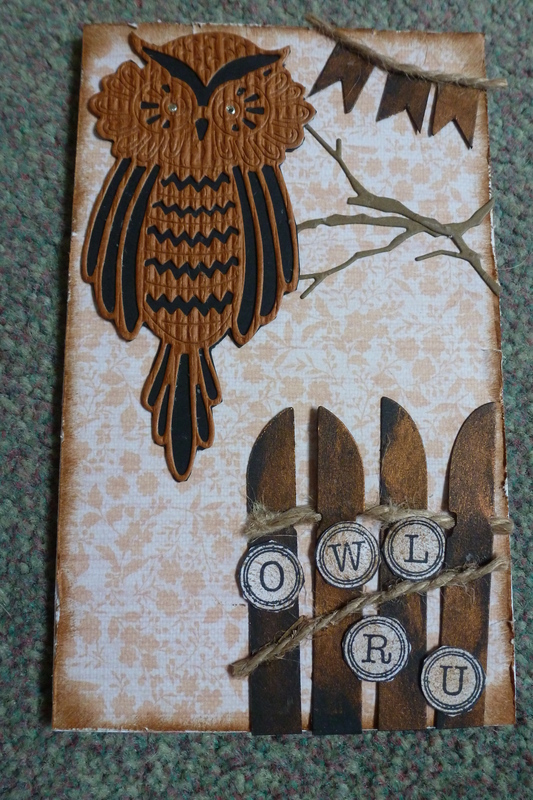 My friend sent me these beautiful die cut owls and this is my first card I made with them. Im rather pleased with this effort! 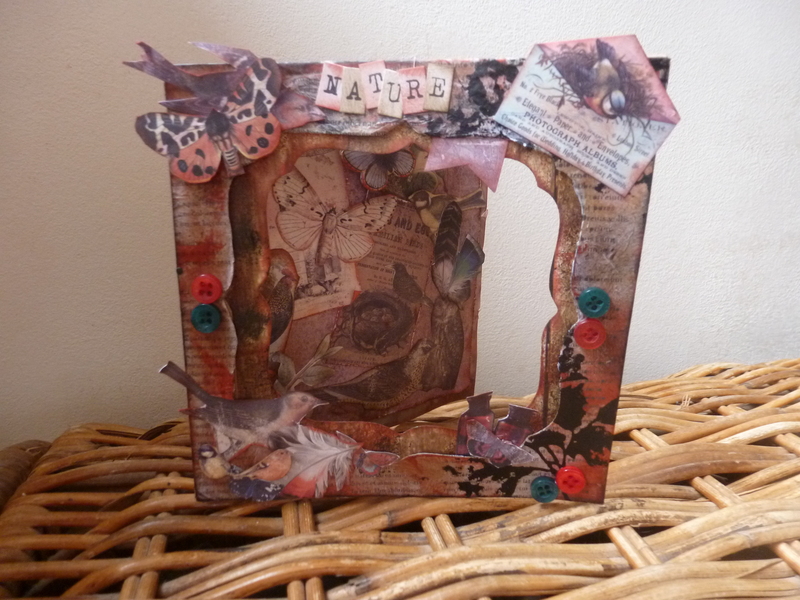 The background is Sew Lovely paper from Papermania and the gate post I made from some offcuts of a bird cage die I cut. 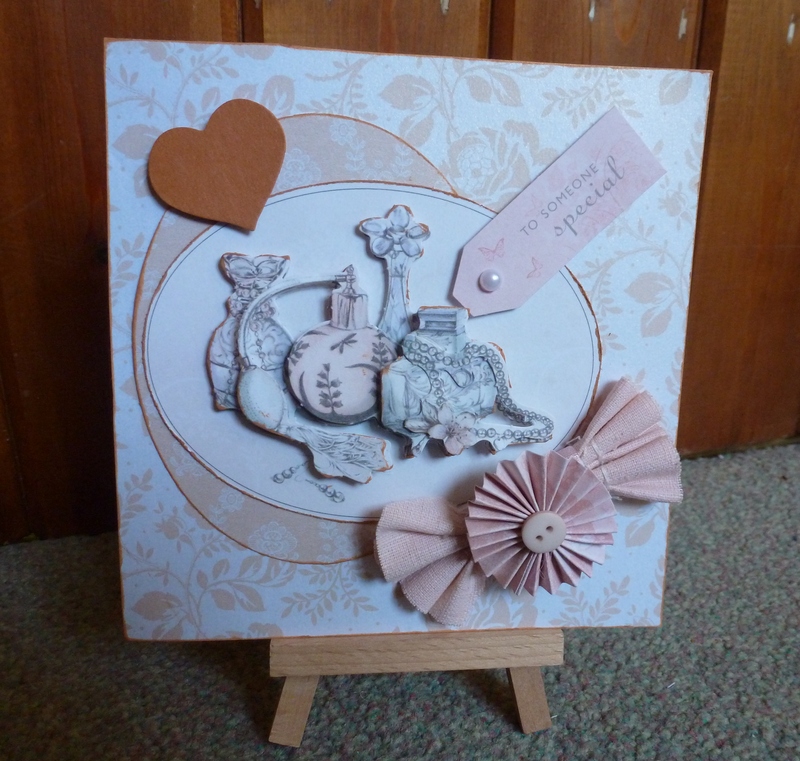 This is a card I made with the gorgeous wood grain stamp from stamping up! 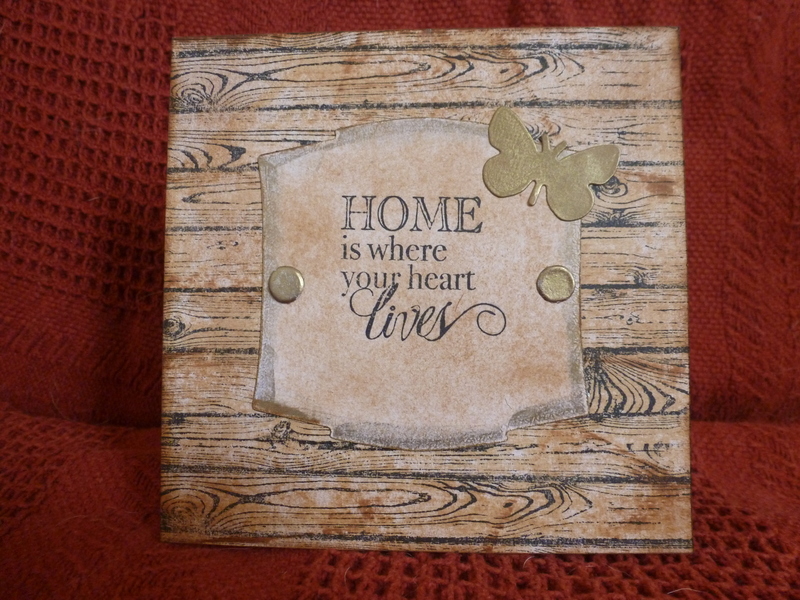 I used Tim Holtz distress inks to age it and then added the sentiment onto a die cut topper and added the butterfly….